The design is the natural integration of various design and functional objectives. The architectural form derives from transforming a pure rectangular block that represents the urban condominium form to achieve the objectives of sustainability and green design criteria. Organizationally, the concepts of entry and the passage from public to private are inherent in the planning of the con- dominiums. 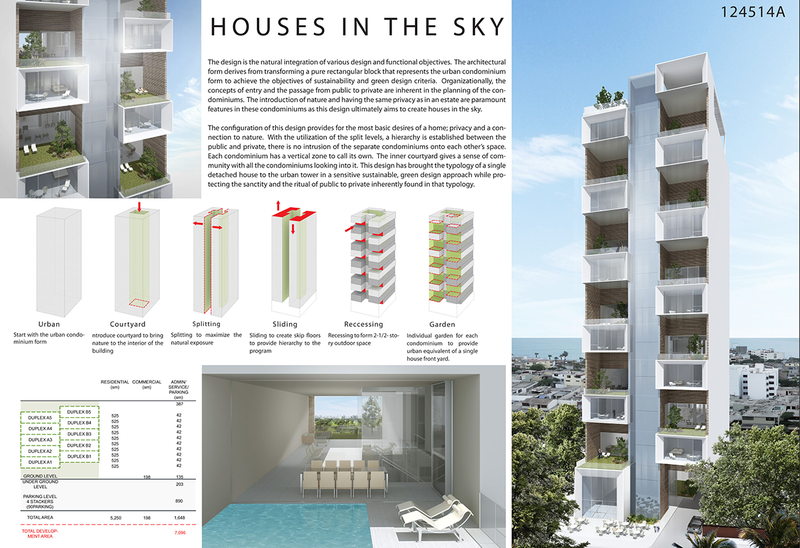 The introduction of nature and having the same privacy as in an estate are paramount features in these condominiums as this design ultimately aims to create houses in the sky. The con guration of this design provides for the most basic desires of a home; privacy and a con- nection to nature. With the utilization of the split levels, a hierarchy is established between the public and private, there is no intrusion of the separate condominiums onto each other’s space. Each condominium has a vertical zone to call its own. The inner courtyard gives a sense of com- munity with all the condominiums looking into it. 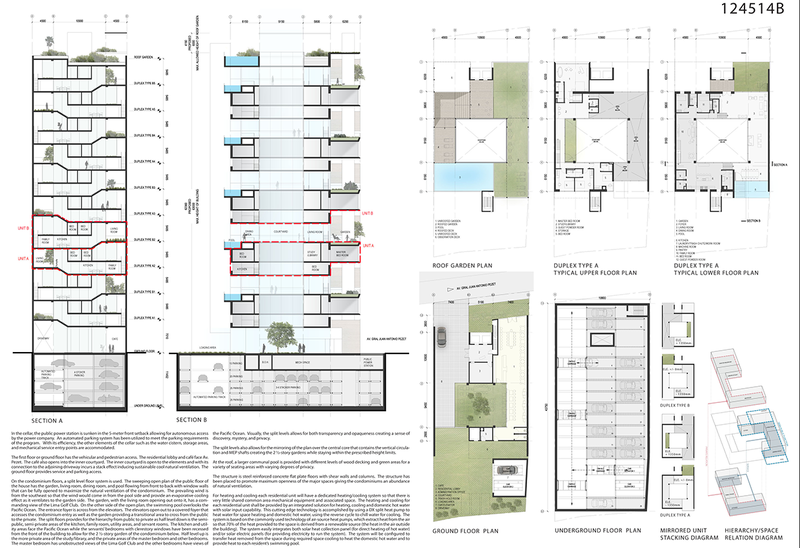 This design has brought the typology of a single detached house to the urban tower in a sensitive sustainable, green design approach while pro- tecting the sanctity and the ritual of public to private inherently found in that typology. In the cellar, the public power station is sunken in the 5-meter front setback allowing for autonomous access by the power company. An automated parking system has been utilized to meet the parking re- quirements of the program. With its e ciency, the other elements of the cellar such as the water cistern, storage areas, and mechanical service entry points are accommodated. The rst oor or ground oor has the vehicular and pedestrian access. The residential lobby and café face Av. Pezet. The café also opens into the inner courtyard. The inner courtyard is open to the elements and with its connection to the adjoining driveway incurs a stack e ect inducing sustainable cool natural ventilation. The ground oor provides service and parking access.